The superintendent's cottage at 'Farnsworth', the C.K.G. Billings estate designed by Guy Lowell c. 1914 in Matinecock. 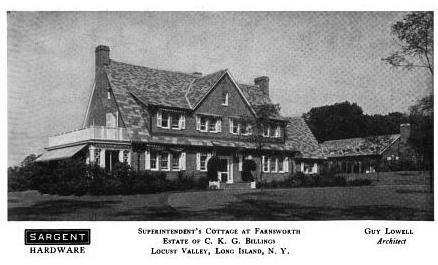 Neither the house nor cottage still stand but click HERE to see more on 'Farnsworth'. Picture from Architectural Forum, 1920.
is that the stables that were beside the cottage? on the historical aerials maps, it looks like the cottage was there in the 2000 photo but replaced by a mcmansion is 2006 altho the stables still seem to be there. farnsworth must have been quite a placed based on the size of the supes cottage. Yes the stables and garage are still standing. This cottage was recently torn down and the house that replaced it was built on spec and has been for sale for years. Fools! What a lovely unassuming and absolutely charming house. Why demolish it? I can only hope what was constructed in its place is vile. One of the basic rules of historic preservation is that if something must be demolished, then at least what replaces it should be as good or better. Why does it seem that this is never true? too bad, that cottage was sort of a local landmark..all mushroom colored and depressing on that corner..I'll take that over most all of what they are building on the North shore anyday. the words nondescript and hodgepodge leap to mind when describing the new house. also, the supes cottage looks to be a bigger house than the new one and definitely with a better provenance. i think charley brown said it best "AUUGGHH"
The pictures in the listing aren't very good but the house is enormous...definitely bigger than the Super's cottage...surprisingly large when you come upon it driving down Chicken Valley Road.